BELIZE CITY, Thurs. Oct. 27, 2016–There were only 3 teams participating in this year’s 8th Annual Charles Solis Memorial Invitational Softball Tournament, which took place on Sunday, October 23, at Rogers Stadium. The competition was nevertheless intense and when it was over, the Belize Bank Bulldogs, who won 3 of their 4 games in the double round-robin, out-scored 2nd place winners, Unitedville Rebels, 6-3, were crowned champions for the third straight time. At the end of the round-robin phase, both the Bulldogs and the Rebels had similar records of 3 wins and 1 loss, while Independence PALS was winless with a 0 and 4 record. By the ground rule agreed upon by the teams, “in the case of a tie, the runs for and against for the two teams tied would be used to determine the winner. As such Belize Bank Bulldogs outscored Unitedville Rebels, 6-3, and were thus declared champion. Charles Solis’ son, Lorne Solis, presented the Charles Solis Memorial Cup to the Bulldogs, who have won it for the 3rd consecutive time and so they get to keep it. He also presented medals to the 1st and 2nd place winners. 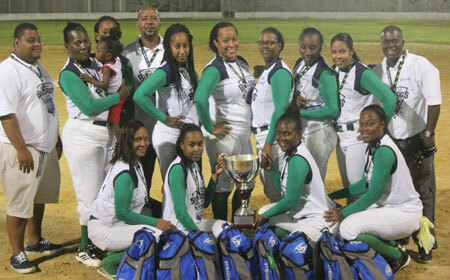 The Most Valuable Player award went to pitcher Ashley Lucas of Belize Bank Bulldogs.